It was sold at John Adams in Dublin, April 4th 2002, lot 79 for £1,700. This lot had two portraits in it, one of R.I.H Coxe, and one of T Eyre. You’ll see from the image here that Banksy’s portrait has an inscription. I couldn’t read it before but with the lot details you can now make it out as T. Eyre, and then MD, or maybe MA. 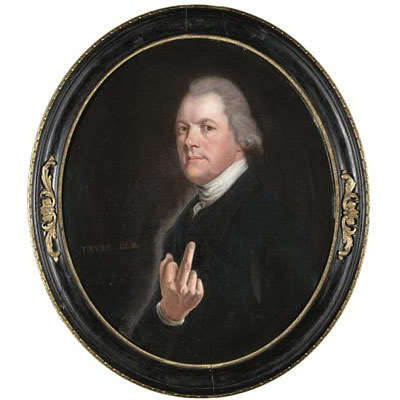 The inscription is rather blocky and uneven, and must be slightly later than the execution of the portrait itself. The identification could be erroneous, of course. But what if it isn’t? Could it be that in the late 1770s there were two men in polite society as alike – at least from the neck up – as Sidney Carton and Charles Darnay? It’s a fascinating thought. I shall have to find out if T Eyre – so far an elusive figure – is related to the Eyre brothers of Bath who bought Clifden Castle in Galway in 1850. That at least might link him to Bath – where Beach painted – and Ireland where this portrait ended up. As far as Dr Eyre and Mr Mason go, the mystery remains for the moment. When I am next in the archive I will see if there is any other likeness of Dr Eyre. But whichever one of them it is must be amazed right now at the way their portrait has become an icon of another age.